A pedestrian village within a college campus that foregrounds the natural amenities of the site. 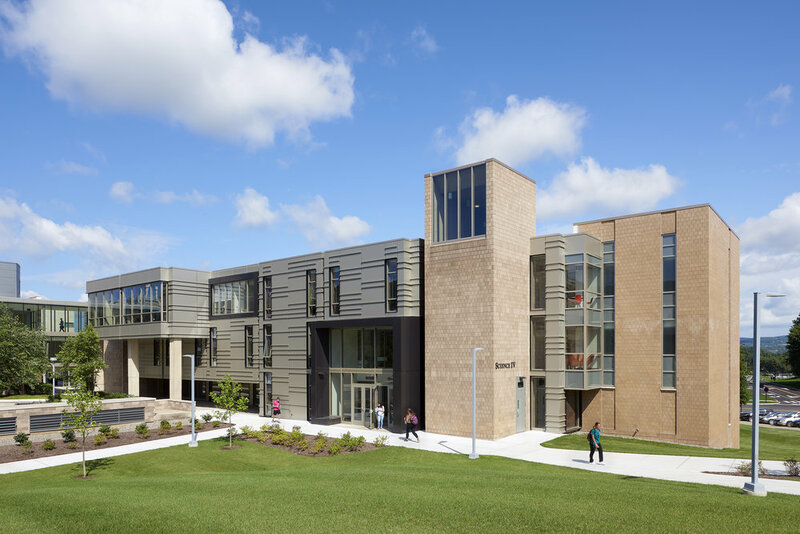 The State University of New York sought new student housing for their campus which would provide an alternative for upperclassmen who typically moved to off-campus living arrangements. The site is situated on the southwest corner of the campus within a wooded area with a compelling view of Glimmerglass Lagoon. The program required accommodations for 350 students in 280,000 sq. ft., with a budget of $34 million. the townhouse units were arranged to define two pedestrian “Main Street” spaces and a central common lawn. This strategy of anti-suburban density aims to encourage interaction between residents and promote a sense of community, as well as minimize disturbance to wetland areas. A Commons Building, developed in a Great Lodge aesthetic, provides for further interaction where students get their mail, enjoy the Lounge and Café, Recreation Room, and Study Lounge. This responds to both the local pre-war residential architectural vernacular and the planning density. The typical two- or three-story units include a private entrance to each townhouse facing Main Street. Each townhouse includes either four or six single bedrooms, shared bathrooms, and a ground floor open plan common living/kitchen/dining area. The townhouses were awarded LEED Gold certification by the United States Green Building Council for achievement in green homebuilding and design. Designed in collaboration with Burt Hill.